As I mentioned in Not Who We Thought We Were, my great, great grandfather may have changed his name from Shailer to Brainard. 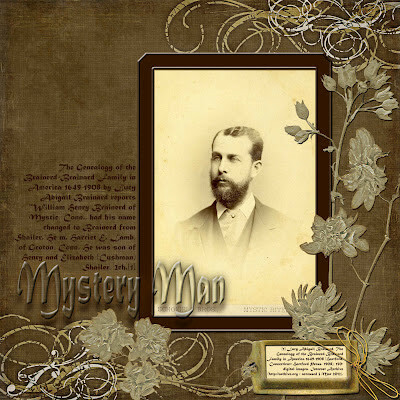 When I began to create this family history page, I hoped to capture the mystery that surrounds my maiden name, but as I worked the story became about the enduring draw I have, since childhood, felt from my ancestors. Although rooted in the present, part of me lives in the past and usually the quite distant past, not yesterday or last month. The trio of men are my three grandfathers, who brought this surname forward to my Dad. 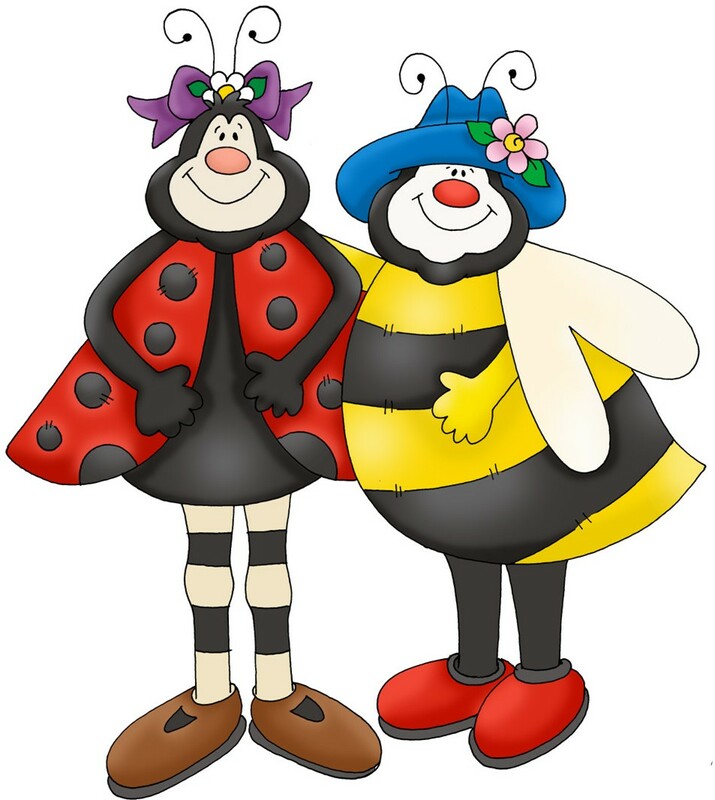 I have been thinking about them quite a lot and wondering how the story of our surname was lost, or was it purposely forgotten? In the layout a much younger me is ready to climb over the wall into the past seeking understanding of my grandfathers' lives. She is already starting her climb as if she cannot resist the pull. Have you experienced this feeling? When did it start? Not Who We Thought We Were! It appears that we may NOT be from the Brainard family. 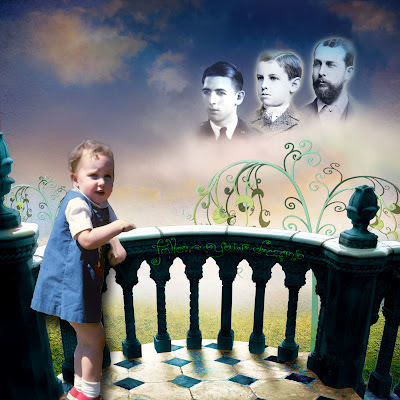 It happens and you should expect that when you delve into your family's genealogy, the beliefs you hold will be challenged. My time for challenge is now. 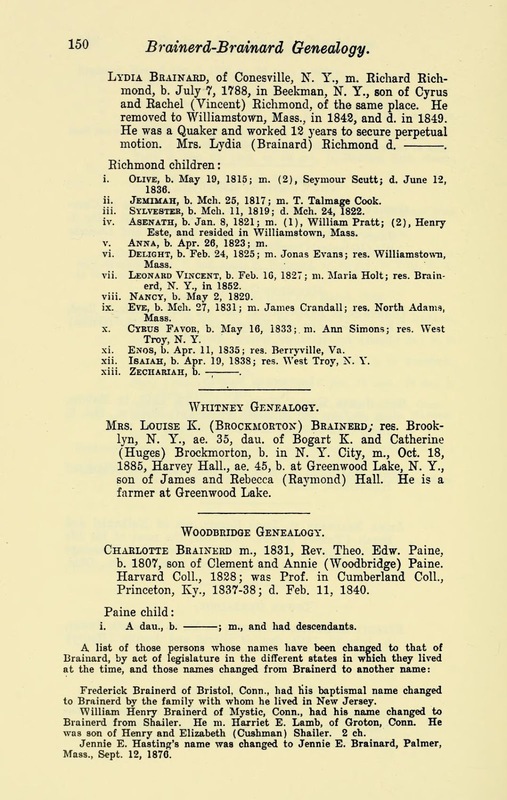 My assumptions have been called into question, by just a couple of sentences in a compiled family genealogy. These sentences, a mere postscript, if proved correct, will change the historical path of our family history. William Henry Brainard or William Henry Shailer? 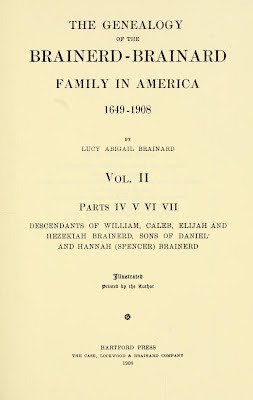 The Genealogy of the Brainerd-Brainard Family in America 1649-1908 by Lucy Abigail Brainard reports "William Henry Brainerd of Mystic, Conn., had his name changed to Brainerd from Shailer. He m. Harriet E. Lamb, of Groton, Conn. 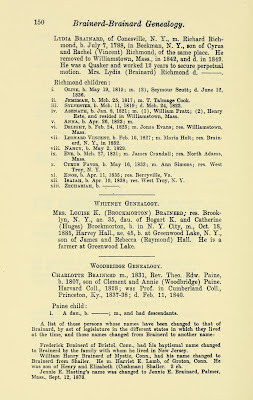 He was son of Henry and Elizabeth (Cushman) Shailer, 2ch. We thought his name was William Henry Brainard. 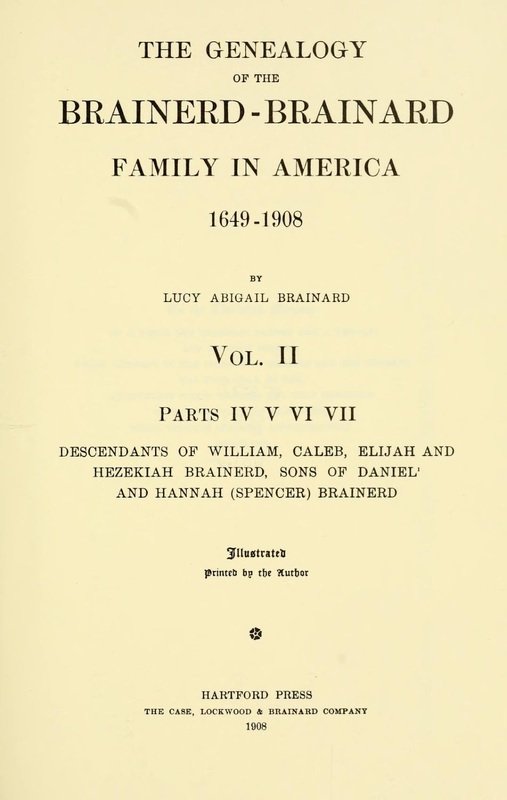 We thought our family traced back through William to Daniel Brainerd in the early seventeenth century in today's Haddam, Connecticut. What you think is very different from what you know in genealogy. William, my great, great grandfather was a man of mystery, his records having reported several different places of origin. His birth record has to date remained elusive. And now, this...a few sentences adding to the confusion of his parentage. Luckily in genealogy, when you lose one, you gain one. We may lose our Brainard pedigree, but we will gain a whole new family. It's time to start hunting the Shailers (Shaylor, Shailor). Has one of your core family stories been challenged? Have you lost one family and gained a new one? Tell us your story. Archive (http://archive.org/ : accessed 3 March 2012). One of our fellow geneabloggers sent me the following press release for her new series of genealogy lesson books for kids. Not just for teachers, these books would be a great way to introduce your own children to the world of genealogical research. Check them out! Chicago, Illinois – March 23, 2012: Professional Genealogist, Jennifer Holik, of Generations publishes six new genealogy textbooks for kids. Parents, teachers, and genealogical societies looking for a how-to genealogy textbook for elementary through high school-aged students need to look no further. In Branching Out, a new series available from Generations, author and professional genealogist Jennifer Holik provides parents and educators with the tools they need to teach genealogical research skills to children and teens. ProQuest has an ongoing series of free (Yes, free!) 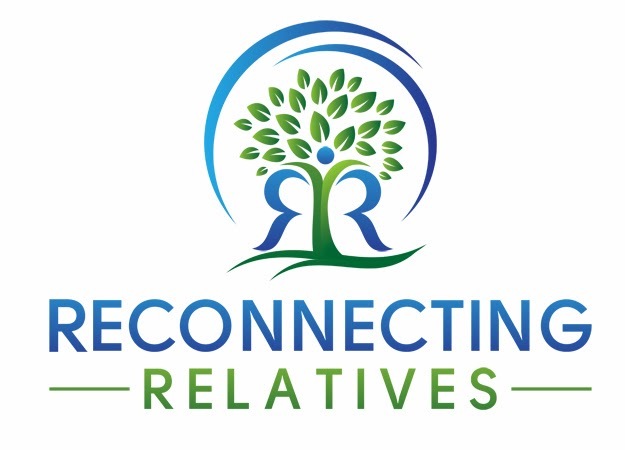 webinars covering different aspects of both HeritageQuest Online and Ancestry Library Edition. Want more? Check out the ProQuest Genealogy page and the ProQuest YouTube channel. Not all digital research tools are available at all libraries. Check your local library's holdings on the library website under digital products or simply ask your librarian. If your library doesn't carry the title you seek, check other libraries in your area. One of my best friends has renewed her interest in researching her family tree. Woo hoo!!! An in person, non-virtual friend...who is actually interested in genealogy. She has caught the bug! How lucky am I? Like many who catch the genealogy bug, my friend would love to jump ahead and collect as much information as she can, but she has been allowing me to offer some guidance and I am thrilled at all the great discoveries she has made. Contacted and gently prodded family information and records from her living relatives. Made a research plan of the vital records she needed to collect for her direct line ancestors. Visited the town clerks where she suspected her ancestors' vital records would have been recorded. Joined Ancestry.com and began using both Family Search and Find a Grave. She has been learning how to do a targeted Google search and has consulted genealogies and family histories. Tramped through cemeteries all over southeastern New Hampshire. Took pictures of her ancestors' graves as well as the graves all around her ancestors' burial plots. Bought a special notebook to use specifically for her research notes so that she doesn't end up with lots of slips of loose paper. Started a binder with a tab for each of her direct line surnames and individual sections for each of her direct line ancestors. Began filing her documents according to surname. Created a Dropbox account to share documents with me and with her family members. Hasn't she been doing a great job? She gets that it is important to not give up and even has a plan to look at alternative records for proving familial relationships. Another important skill she has used frequently is an often overlooked one: ask a question if you can't find something or you don't understand something. Not only has she been asking me questions, but also those she has met in her research journey. This leads me to a question she recently asked me and to the second part of this post. My friend is not shy, no, not at all. Everywhere she goes, she strikes up conversations. She had a nice talk with a local historian, who told her the advice he gives to most newbie genealogy researchers. When you start out, don't bother with getting all those original records, gather information from the people, who have already shared their family trees. What?? This is not the way to begin your genealogy research! Random copying of names, dates, places and events from books and websites is never a good idea, unless the facts are linked to sources. Books and websites without sources can and should be consulted to find clues to possible research paths. Thankfully my friend knew enough to ask if the advice was good and she gets it. What about all of the newbies, who didn't know enough to ask? What do you think will happen with their family tree?